"Also, I would crank up the A/C, just gimme a nod." Netflix has debuted the first teaser trailer for the new Adam Sandler comedy premiering on the streaming service, titled The Week Of. As much as this should make you groan, this comedy is actually directed by the great Robert Smigel, most well known for his work on "Saturday Night Live". 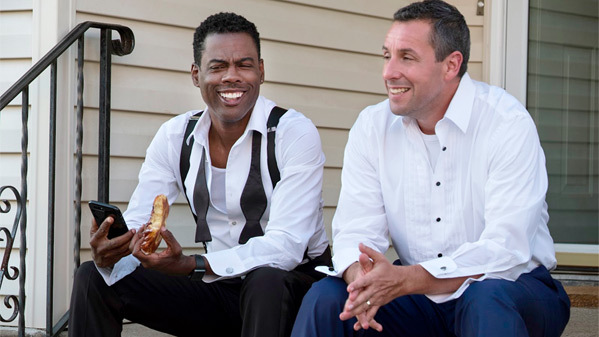 Adam Sandler and Chris Rock star as two "very different" fathers who come together to marry their children together, resulting in a crazy weird, wild, hilarious "week of" the wedding. The full cast includes Steve Buscemi, Rob Morgan, Rachel Dratch, Scott Cohen, Patricia Belcher, and Melanie Nicholls-King. This teaser doesn't show much, but thankfully this doesn't look as awful as Sandler's other Netflix movies. So, that's something. Hopefully it's not a disaster. Get your first look below. When two very different fathers (Adam Sandler & Chris Rock) come together for their children’s wedding, everything that could go wrong, does. Watch the hilarious hijinks as the two try to keep everything afloat, while dealing with their families…and each other. Before they get to the big day, they have to go through a long week. The Week Of is directed by veteran American comedy filmmaker Robert Smigel, making his feature directorial debut after extensive work on "Saturday Night Live" and other TV shows + all the "SNL" animated shorts (Smigel did also write the screemplay for Sandler's You Don't Mess with the Zohan). The screenplay is co-written by Robert Smigel and Adam Sandler. Netflix will be debuting Smigel's The Week Of streaming exclusively starting on April 27th this spring. First impression? Who wants to see this already?